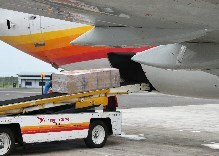 Surinam Airways Cargo offers you direct service to eight key destinations. These gateways give shippers the opportunity to send their cargo to other destinations in connection with other airlines or via trucking companies. For North America the gateway is Miami. On Tuesdays we offer an all freighter service Miami to Paramaribo v.v. Handling agent ( MIA) : Strategic Air Services Inc.
Cut - off time : Monday 18.00 p.m. Delivery days : 7 days a week 08.00 a.m. - 16.00 p.m.